District Six is comprised of the following counties: Burt, Cedar, Dakota, Dixon, Dodge, Thurston, and Washington. Public Guardian districts are distinct from judicial and probation districts. Please find the Associate Public Guardian serving your area below. The Office of Public Guardian (OPG) is assisted by an Advisory Council, appointed by the Administrator of the Courts[i], to advise the Public Guardian on the administration of public guardianships and conservatorships. [ii] Members of the Advisory Council, shall be comprised of individuals from a variety of disciplines who are knowledgeable in guardianship and conservatorship, and be representative of the geographical and cultural diversity of the state and reflect gender fairness[iii]. As required by the Act, the appointments of initial members of the Advisory Council were made within ninety days after January 1, 2015. Initial appointments were staggered terms of one, two or three years, as determined by the State Court Administrator; subsequent terms shall be for three years. 21Neb. Rev. Stat. § 30-4106. 22Neb. Rev. Stat. § 30-4108. 23Neb. Rev. Stat. § 30-4106. Corey R. Steel was appointed State Court Administrator on May 2, 2014, to oversee the administrative operations of the statewide court system. The State Court Administrator plans for statewide Judicial Branch needs, develops and promotes statewide administrative practices and procedures, oversees the operation of trial court programs and strategic initiatives, and serves as a liaison with other branches of government. Prior to his appointment he served in the capacity of Deputy Probation Administrator for Juvenile Services. He played an active role in providing information to the Legislature regarding juvenile justice reform and coordination of state wide juvenile probation services. Throughout his employment, Steel has been heavily engaged in the transformation of Probation’s Juvenile Justice System. Serving in a leadership capacity, he was and remains involved in the Juvenile Detention Alternative Initiative (JDAI), the Cross-Over Youth Practice Model, and the Juvenile Information Sharing Project. In addition to holding a Bachelor’s degree in Criminal Justice from the University of Nebraska – Kearney and a Master’s in Business Management from Doane College, he also holds two certifications from the Georgetown University Public Policy Institute in Juvenile Justice and Child Welfare and serves as an adjunct professor for Southeast Community College teaching Juvenile Justice, Criminal Justice, and Sociology. Dianne DeLair is the senior staff attorney with Disability Rights Nebraska, the designated Protection and Advocacy system for the state of Nebraska. Ms. DeLair’s practice is devoted entirely to address abuse, neglect, and discrimination based on disability. She has represented individuals with disabilities for over 17 years in state and federal court. She has also represented individuals in county court guardianship matters, and administrative appeals. Representing the County Judge role is Judge Todd Hutton, Omaha. 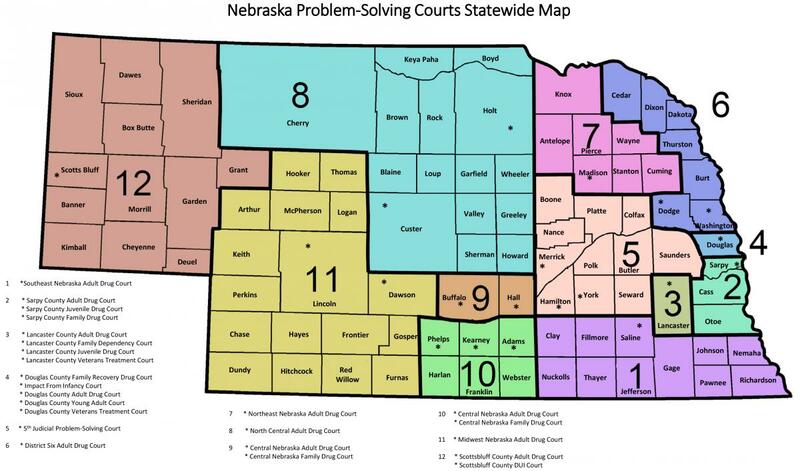 Judge Hutton represents the 2nd Judicial District of Cass, Otoe & Sarpy counties in Nebraska. Todd Hutton attended the University of Miami where he received his Bachelor of Science. He then went on to further his education at the University of Creighton School of Law where he received his Juris Doctorate. He was sworn in to be a Sarpy County Court Judge in 1998. Prior to becoming a judge, Todd Hutton worked as a lawyer in the Omaha area for 8 years. Judge Hutton serves on many committees and organizations in the community. He currently is co-chair of the Nebraska Supreme Court Commission on Guardianships and Conservatorships. Russ Leavitt is among the original 11 members of the Public Guardian Advisory Council selected by the Supreme Court Administrator to assist and support the Public Guardian in the early, arduous process of implementing the law by creating policies and procedures, and filtering the many logistical issues as the Public Guardian and his staff, worked toward and achieved operational ability. As one of the At-Large members of the Council he will be serving his second appointment. Russ also continues to serve on the Supreme Court Commission on Guardianship and Conservatorship, and serves on three subcommittees (Executive, Public Guardian and Protection of Vulnerable Adults) as part of this commission. Mr. Leavitt is a graduate of Creighton University, BSBA, with a Major in Accounting. He is the Chief Executive Officer of Finance and Technology and Co-owner at General Service Bureau and Early Out Services, Omaha NE. Lisa Line is a partner with Brodkey, Peebles, Belmont and Line in Omaha. Ms. Line’s primary areas of practice includes Probate, Estate, and Trust Planning and Administration; and Administrative Law, including Social Security Disability, Medicare and Medicaid. She assists families through estate planning and asset transfer issues; working with families during the probate or trust administration process; acts as a Court appointed Special Administrator, Guardian ad Litem, or Guardian/Conservator in probate, trust or guardianship/conservatorship actions; represents individuals in the legal process to determine entitlement for benefits; works with families of individuals with disabilities through the estate planning process, which includes both third party special needs trusts and self-settled special needs trusts; and advises Bank Trustees in the administration of special needs trusts, approval of expenditures and reporting to various agencies. Julie Masters, PhD, is professor and chair of the department of Gerontology at the University of Nebraska Omaha. She also is the Terry Haney Chair of Gerontology. Dr. Masters teaches courses on death and dying on the Omaha and Lincoln campuses. In addition, she oversees the activities of the department on the Omaha, Lincoln and online campuses. In addition to her research on end of life planning, Dr. Masters conducts research on healthy aging, caregiving and aging inmates. Amanda Duffy Randall received her BA from Michigan State University, her MSW from the University of Nebraska Omaha, and her Ph.D. from the University of Nebraska Lincoln in Cognitive and Developmental Psychology. She is an associate professor in the School of Social Work, and teaches clinical research and practice courses in the graduate program. She is the past president of the Association of Social Work Boards, the North American regulatory organization for social work licensure, and chaired the Nebraska Board of Mental Health Practice. Dr. Randall currently serves on the board of the Office of Public Guardian of the Nebraska Supreme Court, and consults with Joint Base Command San Antonio, providing training on the Department of Defense regulations on transgender service and family members. Dr. Randall is a member of the Professional Transgender Resource Network, and on the Executive Board of the Behavioral Health Education Center of Nebraska. Kevin Ruser is the Director of Clinical Programs at the College of Law and teaches in the Civil Clinic and the Immigration Clinic. He also co-administers the Litigation Skills Program of Concentrated Study. He is a member of the Nebraska State Bar Association, the American Bar Association, the Clinical Section of the Association of American Law Schools, and the Clinical Legal Educators Association. Mr. Ruser began his role on the Advisory Council for the Office of Public Guardian in January 2016. He is currently a member of the Nebraska Supreme Court Self-Represented Litigants Committee and has been a member of the Robert Van Pelt American Inn of Court. He also serves on the boards of directors of various non-profit corporations. Darla Schiefelbein, Clerk Magistrate, Platte County Court represents an At Large Member of the Advisory Council. She graduated from Wayne State College in 1981, with a Bachelor’s of Science degree in Human Services Counseling and Sociology. Ms. Schiefelbein began employment with the Nebraska Department of Health and Human Services from 1981-1994 working in several caseload areas: Food Stamps, Aid to Dependent Children, Aid to the Aged, Blind and Disabled and preparing home studies for Adoption and Foster Care. She was appointed as Clerk Magistrate of the Platte County Court in 1994 until the present. Ms. Schiefelbein supervises six staff in the court and is responsible for the court caseload and progression. She also audits Guardian/Conservator cases for Sarpy and Hall Counties. Ms. Schiefelbein was appointed to the Nebraska Supreme Court Commission on Guardianships and Conservatorships in 2012. In 2013 she was selected to be one of three Guardian/Conservator Specialists for the state; serving as a resource for county court staff in Nebraska. The goals of the specialists are to work to insure uniformity among the courts and to improve process and forms used for Guardianships and Conservatorships. Previous to appointment as Public Guardian, Ms. Chaffee was Legal Counsel for the Health and Human Services Committee at the Nebraska Legislature. As Legal Counsel for the Health and Human Services Committee she was involved in multiple issues involving social services including long term care, Medicaid, health care, developmental disabilities, behavioral health, legal processes and procedures and licensure. She worked with a wide array of professionals including state, local and county officials, the judiciary, County attorneys, private attorneys, provider networks, facility administrators, caregivers, social service advocates, as well as the individuals who depend on Nebraska social services to provide care and support- children, juveniles, individuals with disabilities, and the elderly. As Legal Counsel she supported the Health and Human Services Committee and Chairs, Senators Tim Gay and Kathy Campbell, as they designed policies and programs to serve vulnerable citizens of Nebraska. The Deputy Public Guardian, Marla Fischer-Lempke, was hired in January 2015. Ms. Fischer-Lempke received her Juris Doctor from the University of Nebraska, College of Law in 2004 and was licensed to practice law in Nebraska that same year. Since that time, she has held several positions and years of experience in advocating for and with people with disabilities and their families. Prior to coming to the Office of Public Guardian, Marla served as an Assistant Ombudsman with the Nebraska Office of Public Counsel where she addressed concerns of Nebraskans who experienced individual and systemic difficulties with programs administered by the Nebraska Department of Health and Human Services. Before Marla was with the Office of Public Counsel, she was the Executive Director for The Arc of Nebraska for five years. In this position, she provided support to thirteen local Arc chapters across Nebraska; provided advocacy in written and verbal testimony on proposed legislation within the Nebraska Unicameral in collaboration with other disability organizations; and provided information, ideas on problem solving, and action on statewide issues affecting the lives of people with developmental disabilities. In 2012, Marla joined the Nebraska Supreme Court Commission on Guardianships and Conservatorships. Marla was also the Public Information Attorney with Disability Rights Nebraska for four years, where she gained experience in developing informational materials for people with disabilities, family members, and interested citizens. She also provided several successful trainings on various topics pertinent to the lives of people with disabilities. She is experienced in the areas of individual and systems level advocacy and has successfully collaborated with other organizations and agencies on many occasions. The OPG staff, outlined in statute, includes the Public Guardian as Director of the Office, a Deputy Director and a multidisciplinary staff including Associate Public Guardians, Associate Public Guardian Legal Counsels, a Business Manager, an Education and Outreach Coordinator and two Administrative Assistants. The Supreme Court Administrator is responsible for appointing a director of the OPG known as the Public Guardian. The Public Guardian shall be an attorney hired based on a broad knowledge of human development, intellectual disabilities, sociology, and psychology and shall have business acuity and experience in public education and volunteer recruitment. The Supreme Court Administrator, with the confirmation by Nebraska Supreme Court, appointed Michelle J. Chaffee as Public Guardian in December 2014. Previous to appointment as Public Guardian, Ms. Chaffee was Legal Counsel for the Health and Human Services Committee at the Nebraska Legislature. As Legal Counsel for the Health and Human Services Committee she was involved in multiple issues involving social services including long term care, Medicaid, health care, developmental disabilities, behavioral health, legal processes and procedures and licensure. She worked with a wide array of professionals including state, local and county officials, the judiciary, County attorneys, private attorneys, provider networks, facility administrators, caregivers, social service advocates, as well as the individuals who depend on Nebraska social services to provide care and support- children, juveniles, individuals with disabilities, and the elderly. As Legal Counsel she supported the Health and Human Services Committee and Chairs, Senators Tim Gay and Kathy Campbell, as they designed policies and programs to serve vulnerable citizens of Nebraska. Prior to the Legislature, Ms. Chaffee spent ten years in higher education administration. In addition to her experiences as Legal Counsel to the Health and Human Services Committee and in higher education administration, Ms. Chaffee practiced law and utilized her law degree in a variety of different state governmental agencies. She served in the Nebraska Legislature as Legislative Aide to Senators Gene Tyson and Mike Avery. During law school she interned for the Nebraska Attorney General’s Office, in the Child Protection and Drug Enforcement Division. Additionally, as a Senior Law Clerk, she researched pre-trial diversion guidelines for the Office of Juvenile Services in the Nebraska Crime Commission. Upon graduation from UNL College of Law, Ms. Chaffee served as an attorney at Legal Aid, focusing on representing the needs of indigent individuals in civil court. As an attorney in private practice, she specialized as a Guardian ad Litem representing the needs of abused and neglected children in Juvenile Court. Prior to attending law school, Ms. Chaffee served for a number of years as a 7-12th grade English and History teacher in Nebraska, Iowa, Missouri and Texas. Under the Act, the Public Guardian responsibilities include: to assume all duties assigned by the Administrator of the Courts; to fulfill the duties and responsibilities of guardian/conservator for appointed individuals; administer public guardianship/conservatorship [ii]; serve as staff to Council[iii]; with advice from the Advisory Council on Public Guardianship[iv], recommend rules to the Supreme Court[v]; designate authority to act on her behalf to deputy and associates;[vi] and report to State Court Administrator, Chief Justice and Legislature on the implementation of the Act on or before January 1 each year[vii]. A summary of the duties completed in 2017 are included in this report. 16Neb. Rev. Stat. § 30-4104. 17Neb. Rev. Stat. § 30-4108) (1). 18Neb. Rev. Stat. § 30-4110. 19Neb. Rev. Stat. § 30-4104. 20Neb. Rev. Stat. § 30-4111. 24 Neb. Rev. Stat. § 30-4104. Chelsea joined the Office of Public Guardian in March of 2019. She earned her Bachelor’s degree in Philosophy from Marist College in Poughkeepsie, NY in 2013, her Master’s degree in Philosophy from University of Nebraska – Lincoln in 2015, and she is currently a PhD Candidate in Philosphy at UNL. She brings over 600 hours of university teaching experience to this position. In particular she has extensive experience in the field of Medical Ethics curriculum development. As an instructor at UNL she taught courses in Philosophy and Women’s and Gender Studies. She is passionate about serving marginalized persons and creating a more just society for everyone. Jill joined the Office of Public Guardian in August of 2017. She came from the Lancaster County Court where she worked as a Records Clerk for four years. Her work experience includes working for Lincoln Public Schools for eight years as a Paraeducator for special needs children. Jill also worked seven years as an EMT in the ICU/Burn Unit at Avera McKennan Hospital in Sioux Falls, South Dakota. It has always been her passion to help people. Jill is honored to support the Office of Public Guardian and all of the needs of the Associate Public Guardians. Sarah Herrera joined the Office of Public Guardian in December 2018. Her clerical background, personal, and professional experiences with people who experience disabilities made this position a natural fit. Assisting in expediting benefits to entitled eligible individuals; conducting intake interviews and providing counseling to a caseload of clients; investigating the financial, psychological, family and social histories of referred individuals; arranging for client services and housing; conducting home and facility visits and inspections; assuring care and treatment best-suited to the clients' interests; recommending action based on informed consent for medical, surgical and hospitalization; and all other responsibilities as required by the type of guardianship identified. Will work with various private and public organizations for the purpose of developing local treatment resources. Responsible for estate management and sound personal and financial management to ensure the most appropriate level and highest quality of care of person and property. Will prepare comprehensive personal and financial court reports, maintain case records, ensure clients' bills are paid; attend court hearings as appropriate; and collect data and statistics as required. Janelle Cantu graduated with a Bachelor’s degree from the University of Nebraska at Omaha in 2001 with a major in Sociology, and holds a certificate from Boston University’s Center for Aging and Disability Education and Research. Janelle was hired with the Department of Health and Human Services’ Children and Family Services as an Economic Services Worker where she managed caseloads with individual receiving food stamps, ADC, childcare, Medicaid and other economic services. Janelle was on the pilot team for the development of the new call center for AccessNebraska. She moved on to DHHS’ Division of Developmental Disabilities and worked as a services coordinator, and managed a caseload of individuals with intellectual disabilities. She helped to transition individuals from the Beatrice State Developmental Center into the community. She also worked with individuals that were court ordered, by a board of mental health petition (BMHP), into the Division’s custody. Janelle acted as a guardian for the individual’s under the BMHP. Janelle also worked with Eastern Nebraska Office on Aging as a services coordinator for individuals over 65 years of age. Jena is a rural Nebraska native who began her career in human services working with aging adults in a memory care setting. She attended Nebraska Wesleyan University in Lincoln and earned her Bachelor's Degree in Social Work and Sociology/Anthropology. Jena went on to attend the University of Nebraska - Omaha and earned her Master's Degree in Social Work. She completed graduate clinical hours providing family therapy at the Munroe Meyer Institute and worked with grandparents raising their grandchildren at Nebraska Children's Home Society. Jena's professional experience includes working with clients experiencing homelessness, substance abuse, mental health diagnoses, and interpersonal violence. She worked in the Intellectual Disability field for 7+ years in multiple roles, most recently as a Developmental Disability Community Coordination Specialist for the Nebraska Department of Health and Human Services. Jena is honored to serve individuals through her role with the Office of Public Guardian. Kimmie Fox was born and raised in Omaha, Nebraska. She attended the University of Nebraska at Lincoln, completing a Bachelor’s of Science in Biology. She received dual Masters’ in Social Gerontology and Legal Studies from the University of Nebraska College of Public Affairs and Community Service and the Nebraska College of Law, respectively. Kimmie interned for AARP Nebraska and the Nebraska Office of Public Guardian, while in undergraduate and graduate school. She took a year of service as an AmeriCorps VISTA, working with the Nebraska State Unit on Aging as a resource developer for senior populations. Kimmie also worked as an adjunct professor at the University of Nebraska at Omaha. Kimmie is excited to be given the opportunity to again work with the Office of Public Guardian. Frederic Graves was born and raised in Grand Island Nebraska. He earned a BAeD with Teaching Endorsements in Communicative Arts at UNK. Fred started working part time with the Intellectually Delayed population in 1992 and worked on several projects at UNK including developing individualized curriculum for both gifted and special needs students. After working 10 years full time with a DD Community Based Service Provider, Fred became a DD Service Coordinator for DHHS in 2006. Fred helped establish a non-profit tabletop gaming club with a mission statement to foster face to face social connections in his community and owns and helps operate a used bookstore he originally purchased with his father. Alicia Husted, also known as Ali, grew up in Cortland, NE, a small town south of Lincoln. She attended the University of Nebraska at Kearney and received a bachelor’s degree in psychobiology, with minors in health science and criminal justice. The majority of her experience has been within the field of developmental disabilities. Alicia started working in college at an Intermediate Care Facility for persons with Intellectual Disabilities. She then moved to providing community based services residentially and then as a Program Trainer for vocational services. Alicia moved back to the Lincoln area after college, briefly working in assisted living before taking a position with DHHS as a Developmental Disabilities service coordinator. She thoroughly enjoyed working in that position for the next 5 years until taking the position as Associate Public Guardian. Lisa Ludden was born and raised in Norfolk, Nebraska. She attended Wayne State College and received a bachelor’s degree in elementary education. While attending her first couple of years of college, she worked as a Direct Support professional in a day settings and then as a residential manager for 5 homes. She then moved to working in long-term care facilities as a social worker and continued for the last 16 years. Lisa’s professional experience includes working with the elderly population, working with dementia, working with various health conditions, establishing in-home services, and working with people and their loved ones during difficult times. Lisa and her family live on a farm near Pierce, Nebraska. Lisa and her husband raise five children and enjoy attending all of their various activities, including coaching their volleyball and basketball teams. Lisa also enjoys raising their cattle, participating in their local 4-H program, and teaching at church. Lisa has loved the opportunity over the last 16 years of serving the elder generation and looks forward to being able to serve and advocate for vulnerable adults as an Associate Public Guardian. Michelle Moore was born and raised in Ogallala, Nebraska. She attended the University of Nebraska at Kearney and received her Bachelor of Arts in Education for Elementary and Early Childhood Education. She went on to teach preschool for several years, which eventually led up to teaching elementary school for 10 years in North Platte, Nebraska. During that time, Michelle worked on her Master’s Degree in Curriculum and Instruction from Doane College and received her degree in 2008. Most recently, she’s been employed at the Nebraska Department of Health and Human Services, working as a Child and Family Services Specialist in the Kearney, Nebraska office. Michelle was with Child Protective Services for 2 ½ years before moving over to Adult Protective Services for her final six months with the department. Michelle has been with the Office of Public Guardian since June of 2015, and is honored to work with Nebraska's vulnerable adults as an Associate Public Guardian. Stacy Rotherham was born and raised in the Scottsbluff/Gering area. She received her Bachelor of Arts in Kinesiology from the University of Northern Colorado. Stacy has worked in long term care for over 12 years as the Director of Alzheimer’s Care, Certified Dementia Practitioner, and Certified Dementia Care Manager. She has loved being able to work and help those with Alzheimer’s and other Dementias, and looks forward to being able to help other vulnerable adults as the Associate Public Guardian for the Panhandle. Annette Scarlett has a degree in Criminal Justice and Special Education. She has been working in the field of Developmental Disabilities since she was 16 years old and has worked at all levels, including the state level as a Services Coordinator for over 9 years. She also has managed a 6-bed nursing facility for those with intellectual disabilities and was a Services Coordinator for the Office on Aging for close to two years. Her latest experience was as an extended family home provider to a 24-year-old male with developmental disabilities. She is guardian and conservator for three others on a private basis, including a family member with developmental disabilities. Annette’s passion is advocating for the rights of others when they are no longer able to do so for themselves. Erin Wiesen is a native Nebraskan, who received her Bachelor of Arts in Applied Psychology and Human Services from College of Saint Mary in Omaha, Nebraska. She went on to receive a Master of Human Services from Concordia University in Seward, Nebraska, with a focus on Leadership and Management. Erin has spent her entire professional career engaged in case management and advocacy work; she has extensive experience in areas of developmental disabilities, mental health, substance abuse, homelessness, and employment readiness. Erin is honored to be a part of the Office of Public Guardian, where she can continue to serve vulnerable persons across Nebraska. Jennifer Cunningham joined the OPG in March of 2019. She has a Bachelor’s degree in Sociology and a Master’s in Urban Studies from the University Nebraska - Omaha. She credits her 5 years of experience working at the non-profit senior citizen advocacy group, VIE (Volunteers Intervening for Equity) now known as VAS (Volunteers Assisting Seniors) for igniting her passion for working with vulnerable adults. While at VIE she served as the Executive Director and initially as a Client Resource Coordinator. She worked with a team of retiree volunteers helping those experiencing problems with Medicaid, Social Security, private insurance, and legal issues. She reviewed and located volunteer conservators for vulnerable adults, and she trained court appointed Guardians and Conservators. Jennifer has also worked as a Social Service Worker for the State of Nebraska determining eligibility for Federal and State programs. She interviewed concerned callers and decided on best responses for the Nebraska Child Abuse and Neglect Hotline. This is in addition to her eight years as a Certified Nursing Assistant on a Memory Care unit providing assistance with Activities of Daily Living and safe mobility. Jennifer's career goal has always been to help people in need overcome barriers in order to have a better life. She is privileged to now serve those in need as an Associate Public Guardian. Conferring with Associate Public Guardians, wards/protected persons, plaintiff attorneys, defendant attorneys, and other interested parties to exchange and prepare information on the facts and status of OPG guardianship and conservatorship cases. Implement legal analysis regarding tax, immigration, property, estate planning, trust, wills, Medicaid, Social Security, Medicare issues to assist APG with determination of legal actions and thoughtful decision making for the wards' best interests. Researches legal precedents, case reports, and other legal documents to collect information for case preparation; prepares initial drafts of correspondence, motions, pleadings, orders, affidavits and other legal documents; represent the OPG in guardianship and conservatorship legal actions in court, as directed by the Deputy Director of the Office of Public Guardian. Sophia grew up in Ft. Worth, Texas where she received a Bachelor of Science in Biology from Texas Woman's University in 1998. Sophia earned a Master of Science in Plant Breeding and Genetics from the University of Nebraska - Lincoln in 2001, and then worked as the Assistant Director for the UNL Upward Bound Math/Science Project. Sophia completed her JD at UNL - College of Law in 2006. During law school, Sophia clerked at Nebraska Disability Rights helping to draft the Law in Brief series and working on a grassroots voting rights campaign for people with disabilities. After graduating from the College of Law, Sophia worked at various private firms and Legal Aid in the areas of family law, juvenile law, criminal law, consumer law, Social Security law, and landlord/tenant law. Sophia's long held passion for public interest law has led her to this position with the Office of Public Guardian.